= Nee asagohan tsukutte kureru? = Jaa omizu motte kite kureru? = Dare ka ni motte kite moraeba! 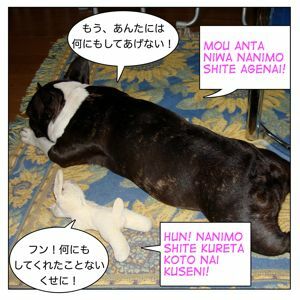 = Mou anta niwa nanimo (or nannimo) shite agenai! = Hun! Nanimo (or Nannimo) shite kureta koto nai kuse ni! We use them when someone does a favor for us or when you do something for someone. 1) We won’t focus on the formal forms in this lesson. 2) くれる ( = kureru), あげる ( = ageru), もらう ( = morau) are used between friends and family. So be careful who you use them with. = Maggie ga (watashini) okashi wo kureta. = Maggie gave me sweets. *Note : Usually the receiver should be “私 ( = watashi), me“, not the third person. = Yamada san ga katou san ni okashi wo kureta. = Yamada san ga musuko ni okashi wo kureta. = Yamada-san gave my son sweets. = Sono okashi wo musuko ni kuremasu ka? = Can you give the sweets to my son? = Sono okashi (wo)musuko ni moraemasu ka? = Maggie, sono okashi (wa) dare gakureta no? = Maggie, who gave you the sweets? = Darekara sono okashi (wo)morattano? = Who did you get that from? Also 私 ( = watashi), “I”, can’t be a subject. = Watashi ga maggie ni okashi wo kureta. = Watashi wa Maggie ni okashi wo ageta. = I gave Maggie sweets. = Anata ga watashi ni okashi wo ageta. = Maggie, watasni ni okashi wo agemasu ka? The third persons can be the subject and object. = Yamada san ga katou san ni okashi wo ageta. = Yamada-san gave Kato-san sweets. = Watashi wa Maggie ni okashi wo moratta. = I received sweets from Maggie. = Kono hana wa dare kara moratta no? = Moushikomi youshi ga hoshii hito wa jimusho de moratte kudasai.? = A person who wants the application form, please receive it at the office. 2) Now let’s learn the statements involving receiving or giving actions. to have someone to do a favor for you. = Suzuki san ga watashi wo ogotta. = Watashi wa Suzuki san ni ogorareta. But these phrases are very “flat” and not natural. We don’t use or hear these in daily life. = Suzuki san ga ogotte kureta. = Maggie ni ogotte ageta. You can use it when you ask someone a favor. = Koko ni namae wo kaite kureru? = Ryouri (o) tsukutte kureru? = Can you cook (for me)? = Ashita(or asu) kite kuremasu ka? →adding ます ( = masu) makes it more polite. = Asa rokuji ni okoshite kureru? = Can you wake me up tomorrow morning? = Haha ga obentou wo tsukutte kureta. = Maggie sensei ga nihongo wo oshiete kuremashita. →adding まし（ = mashi）makes it more polite. = Koko ni namae wo kaite ageru. → adding ます( = masu) makes it more polite. = Asa rokuji ni okoshite ageru. = “I will (do you a favor and) wake you up tomorrow. = Musuko ni obentou wo tsukutte ageru. = Nihongo wo oshiete ageru. = I will (do you a favor) and teach you Japanese. Note: Again we use あげる ( = ageru) and してあげる（ = (shi)te ageru）often between friends but avoid using it towards higher ranking people or superiors. We use it with equal level or lower ranking people. So if you misuse it with superiors, they might think you are looking down on them. ~ (し )て) もらう( = 〜(shi)te morau) to have someone to do a favor for you. = Koko ni namae wo kaite morau. = to have someone write their name (for me). = Ryouri wo tsukutte morau. = Ashita (asu) kite morau. = Asa rokuji ni okoshite morau. = Haha ni obentou wo tsukutte morau. = to have mother to make lunch for me. = Maggie sensei ni nihongo wo oshiete morau. Now it is time to practice!! 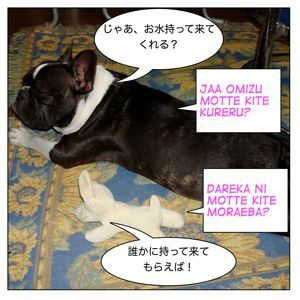 Try to make sentences using the following verbs and make あげる ( = ageru), くれる ( = kureru),もらう ( = morau) sentences. 3)もらう ( = morau) to receive ** might be confusing but please try! = Ashita sentaku wo shite ageyou ka? = Do you want me to do the laundry for you tomorrow? *洗濯をしてくれる。( = sentaku wo shite kureru?) Someone do the laundry for me? = Sentaku wo shite kureru no? = Will you do the laundry for me? = Itsumo haha ni sentaku wo shite moratte iru. = I always have my mom do the laundry. = I will go to town so I will do the shopping for you. = Tsuide ni kaimono ni itte kureru? = Tanaka san ni ochuugen no kaimono wo shite morau. = Kore are mo iranaino? Nara moratte ageruyo. = Kono fuku ookii kara dare ka moratte kureru? = Dare mo iranai no nara kare ni moratte moraimasu. = If nobody wants this, I will have him take it. = Anata no heya kitanai kara souji wo shite ageyou ka? = “Your room is getting messier. Do you want me to clean it up for you? = Souji wo shite kureru hito ga ite iine. = Hewa ga kitanaku natte kitakara kare ni souji wo shite moraou. = Since the room is getting, let’s get him to clean it up. = Kinou tsukutte ageta kara kyou wa Maggie no ban dayo! = Kondo watashi no ban? = Is this my turn? = He can’t do anything, but he always complains. If you want to learn more about　くせに ( = kuseni) go check this lesson. = Eh? Barentain ni nani mo moartte inai tte? = I will give you a good score if you give me something for “White Day”! What? You didn’t get anything from me for Valentine’s Day? Esta leccion está traducida en español. Our friend, Orti, volunteered to translate this lesson in Spanish. Go check the translation. Click here. For this sentence, if I want to use keigo for showing my respect to Maggie sensei, how do I say? If i want to use keigo also, how do I say? Maggie Sensei taught me Japanese. あげました can be used for the third person but the you can’t use keigo there. Now I know that the honorific expression of tekureru is tekudasaru. The humble form of teageru is sashiageru. How to use the humble here ? I just posted 謙譲語／敬語 lessons so hopefully you can learn something from those lessons as well. Thank you for the nice example sentence. I feel flattered. Thank you Maggie sensei !!!! Yes, you got them right. Thanks for making this lesson. It’s so great. This is the topic which is not easily to digest …. Vてあげる、Vてくれる、Vてもらう are giving and receiving centering on “私”. Those grammar can be giving, can be receiving but they are centering on “watashi” like” do favor to “watashi”, “watashi” have SO do some favor, “watashi” received favor someone did. くれる／あげる／もらう is based on the speaker’s point of view. You can also describe the third person does something for the other third person from their point of view. I have a question. Could you please help me? Is that mean ” Why don’t we order coca cola”? (3) But this sentence I don”t know the meaning, could you help me? Why don’t you (or we) order Coke? (2) Your interpretation is right. (3) You are coming to the store (restaurant, coffee shop) (to work for me), right? Thank you so much much much! You are very very welcome! Last week my friend went to Japan for business. —–> Can I say this? or he vouluntarily bought it for me? 3, In all (1)(2)(3), I finish by ました to show my respect attitude to my mom, not to my friend. Did I do it correctly? Again, if you say 日本のリップスティック, it could be just a lipstick which is made in Japan. You can buy them anywhere in the world. But if you say 私は友達に日本でリップスティックを買ってきてもらいました。, it implies he bought a lipstick in Japan and brought it back to you. To stress that I don’t ask him but because I’m a special friend with him, he voluntarily bought then brought lipstick from Japan for me. 🔴Q3, In all sentence, I finish by ました to show my respect attitude to my mom, not to my friend. Did I do it correctly? 1. Yes, your interpretation is correct. This sentence sounds like you asked him to buy a lipstick from Japan for you. Q3: You usually use casual form when you talk to your own mother but it is possible to use ました form. That’s fine. But again, when you are talking to your younger brother, you can stick to the casual form, too. I’m happy to hear you understood. Please say hello to your younger brother! Now here’s where I’m uncertain, is it even possible to use あげて+います like that? Should it have been 作っていてあげます instead? Or are they both wrong and the あげて does not belong there at all? Great! Your sentence is much more natural. You can omit あげて part. You are going to see the friend so that is why you are making a cake. Was this a correct way to do it? Thank you for your help! Your website has helped me so much! The basic pattern of あげる・くれる・もらう are as follows. * Aさん＋から/に ＋（〜を）+ ( Vて ) ＋もらう (polite いただく）You or your close family receives something from A-san. * Aさん＋に＋（〜を）+ ( Vて ) ＋あげる　(polite さしあげる）You do/give something for A-san. (When you use ていた, etc to describer the situaion. you can talk about other people. So you can not use the pattern with “everyone” and “Tom” unless Tom is your family or someone really close to you. Actually, I just realized that since I’m not familiar with Tom, would it be incorrect/wrong to make the sentence more informal? Hello Maggie Sensei. i want to ask something. when i attend some of short course, the man who explain everthing said this. i don’t really understand, does that sentence mean he explain things to himself ? OK, when did he say that? before you explain something or give a speech. Thankyou for the answer maggie sensei. Maybe i was wrong when hearing things. those two sentence above is very similar and maybe the speaker is too fast so i hear different things. so, 説明していただきます literally can be translated to i receive that you let me explain things ? is it correct ? And 説明させていただきます means “allow me to explain it” just like 一言言わせていただきます = allow me to say one thing / let me say one thing. Thankyou very much for the explanation maggie sensei and 天人! Maggie sensei ga nihongo o oshiete kuremashita. Maggie sensei ni nihongo o oshiete morau. Why is one marked ga and ni can you explain? The subject is a speaker not Maggie. Tasukete kurete arigatou gozaimasu!”ga”to “wa* no tsukai kata wa yoku wakarimasen.subject an topic seem the same to me lol in this case there is a difference though. Maggie sensei wa nihongo wo oshiete imasu. 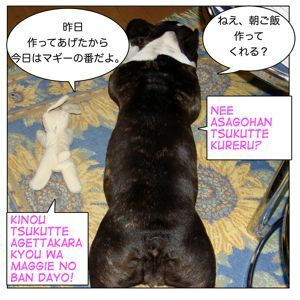 = Maggie teaches Japanese. Maggie sensei ga nihongo wo oshiete kuremashita. So basically “ga” stress what comes before. I would like to know if there is any difference in nunace between てくれる and てもらうsince most answers about it are ambiguous and contradict each other or some don’t mantion any difference between them so it would be importat to clarify any difference that may exist between the two. Some say てもらう implies you asked a person to do something for you. How true is that? Could you explain, please? OK, let’s compare the following two sentences. Focusing on “my friend” who lent me a book. Q: てもらう implies you asked a person to do something for you. How true is that? It will be easier to understand with more context. I forgot my textbook but my friend lent me hers. ” Kono hana wo dare kara moratta no? You use は when you talk about something and は has a function as a topic indicator. I got these flowers from Karl. As for these flowers, I got (them) from Karl. So you make it clear what you are talking about by using は in Japanese. Amongst the options, あげました and いただきました confused me. Because i think both can be the answers. But i was wrong, the answer was あげました only. Can’t “もらう / いただく” be used for ‘third person’ from ‘third person? If so, how to say “receive” for third person to third person that’s not close to me? but it will be unnatural to use honorific/humble expression for the third person unless they are your family or someone you emphasize with. So i don’t have to use honorific expression to someone older than me yet not personally close? For example, let’s say i have a neighbor, named A, who is 50 years older than me. I’m not personally close to A yet i know A and respect A. If i want to say B received chocolate from A, i don’t have to use honorific expression (itadaita)? Just say moratta / moraimashita is enough? Because i thought honorifics is used for someone older or someone you respect for… No matter how close or not you are to that person…. Maggie sensei, please HELP ME! I have some questions about てもらう and てくれる. お姉さんに駅まで送ってくれる. This means “My syster will take me at station ? お姉さんにプールに行くように誘ってくれる. This means “I was invited by my sister to go to the pool? This pharses below means the same ? Please help me understand this form !!! →（私は）お姉さんに駅まで送ってもらう I got my sister take me to the station. You can also say お姉さんが（私を）駅まで送ってくれる。 My sister will take me to the station for me. I was invited / asked by my sister to go to the swimming pool? I was wondering if it means “Because I have a friend who can see it” ? so thats why Its a pretty confussing sentence for me .Can you help me out? It must be a part of some casual conversation. is it right? Means Maggie sensei taught me japanese ? I’m playing the Japanese version of Final Fantasy III on my PSP. In the early part of the game (right now I’m before the final boss fight) the 光の戦士たち were captured by the bahamur dragon at Dragon’s Peak and sent back into his nest. They found there a guy called デッシュ, which apparently was the one who they were searching for. Now it comes my 気になる part. The moment デッシュ saw them, he started the conversation with: 「ハハハ！すべて見物させてもらったよ。おまえたちもドジだねえ～！ドラゴンにさらわれてザマないな！」. I want just to make sure that I understand 「見物させてもらったよ」 correctly. Two translation-possibilities, where only one is correct. 1. Ironically speaking, the party received a favour from the Dragon of sightseeing his nest; デッシュ describes the situation from the party’s perspective, that’s why he uses ～てもらう. 2. デッシュ allowed himself to watch (to observe) the whole spectacle, where the dragon captured the party, etc. – This explains, why ～させてもらう was used. In your opinion, Maggie, which point is correct, No. 1 or No. 2? Which translation of ザマないな would fit here the most? You can not exactly translate the nuance in English but 見物させてもらったよ just means “I saw / I have seen”. You use passive causative form when you look down on someone to show you are superior to others. = I have heard everything. / I heard everything. I took the liberty of watching the whole thing. but he uses his politeness as sarcasm. Thank you very much Maggie for your help! Thanks to you, I learned something new today. Yesterday I completed FF III! But I’m gonna spend a few days to make my save file a perfect one. You likely think its useless and pointless to help others. I got it. You’ve got no urge to help me at all. Fine, do as you want. I’d like to know when to use this “verb+teagetai” to indicate the listner’s urges toward us. Does it need to have a “toiukimochi\toiukanji” after “verb+teagetai”? expresses one’s desires (urge) to do something for someone. The difference is while 手伝いたい is just expressing one’s desire, 手伝ってあげたい is used when you believe your action will help someone. “verb+teagetai” to indicate the listener’s urges toward us. In the second example sentence, the speaker is talking to someone else. So, the speaker thinks, the listener has no urge/desire to help the speaker. Regarding the question: “Does it need to have a “toiukimochi\toiukanji” after “verb+teagetai”?” The answer is yes. In this case the という part has the function of describing what (kind of) feeling does the speaker mean, namely the feeling (or desire) to help someone (手伝ってあげたい). 2) the action is toward others (me or other people are the receivers of that action). Just think like I’d talking to you and come to the conclusion, that you have got no urge to help other people (or particularly me) at all. You are the source of the action, and the action is toward others, therefore you have to use ～てあげたい and because I’m describing, what kind of action I mean, I use という気持ち. To be absolutely clear ” therefore you have to use ” => “therefore I have to use”. I, because I am sending the communicate (my opinion) to you. It’s a bit confusing, but no panic. After 5 years of regular contact with 日本語you gonna get used to it! Thank you for helping David! Sorry. I forgot to answer your question but 天人 helped you. That’s very nice of him! By the way,you said that usingにもらう｜にくれる on queries sound like the speaker is asking the listener to give something to the person on the setence. will it mean “can you give him money” as a favor to the speaker or to the one who’ll get the money? If no one else wants this,I’ll have him take it. Is that guy supposed to take it for him or for the speaker? Seems like it means “I’ll ask him to take it for himself as a favor to me”. About the もらってもらう、your “そのお菓子をあなたの息子さんからもらってもらえますか？” example shows it as a もらってさせる (don’t know if this exist,though). Wonder whether I’m right or not. Some help would be good. Thanks! A boss is talking to his subordinate. = I will have you do this work. = They haven’t done anything so I will have them help us more. = When she comes, please let her eat anything she likes. →？？？You are asking someone to give you some snack? I got anything you on your previous message,yet I’m still trying to figure out how to use もらってもらう propely. Its the kind of thing I’ve never heard nor read before. means”will you take this book from me as a favor”? I meant “I got ,understood everying” from your last reply,not I got “anything”. Sorry. But again, 俺にその本、くれない？ is more natural. BTW, you know 俺 is a male speech and it sounds a bit rough, right? I made this lesson long time ago. Now I think of it, I shouldn’t have included もらってもらう here. It depends on your level but it may have just confused you. Sorry. If the lines above are wrong (they likely are) then should I think of morattemorau as a “make someone else take a thing that belongs to the speaker or listener”? Like as 取ってさせる? if no one wants this book then I’ll make him\ allow him to own it (as a favor for me). ね、 この本もらってもらう？ →もらってくれる？ is more natural. 取ってさせる→ You don’t say that. Now I understand the difference between あげます and くれます, I only have one question regarding もらいます. I know where the position of わたし　should be in senteces using あげます　and くれます. I’m just not sure where わたし　can be if I say もらいます. But if I want to say: “My mother received flowers from me”, can is say: 母は私に花をもらいました。? Hi Berry. Sorry. I found your four messages. They went to SPAM folder for some reason. I erased the other three messages. I think I somewhat understand it after looking at the posts a couple of times. The gist of it isn’t really about the particle に or the change in verb form. It is about the speaker/listeners’ perspective. Do correct me if i am wrong on this. For example, it would be odd just to say “そのお菓子を息子にもらえますか” (can you receive that sweet from my son) since it would be rude to reject a gift when someone offers it to you in Japanese culture, let alone of a children. (It is okay to reject once or twice, however, to initiate this kind of question would probably means that “my son” has been rejected at least dozen times). Because of this, whenever this question is initiated, it can only be perceived as “can i receive that sweet from my son” since the other option, “can you receive that sweet from my son” is literally not possible due to the norms Japanese shares. Someone else was asking me the same question in past. You learned the following pattern with a particle に and もらう , right? = I received a book from Maggie. = Maggie lends me a book. V+てもらう = to have someone to do a favor for you. Now, how would you say when you want a book from me? Can you give a book for Maggie? The receiver of the book is Maggie. = Can I have a book (from you)? = Can you lend me a book? You can use the same idea for this sentence. もらえませんか？ Can I have = Can you give ? Can you give that sweet to my son? Sorry for the additional post as I just stumbled across a similar question. I still can’t understand why it would differ so much just because the form of the verb changes. I am betting that the gist of it lies within the particle “に”. But even if the “に” here is “のために”, under what circumstances should we see the “に” here as “のために”? Because of the particle “ni” and the receiving verb, shouldn’t it be (can you) received sweets from my son? i assume it is used in the “to hear” meaning right? In this it would mean : “i would like to receive the favor from you that you let me hear you??? ?” Basivally i don’t know who would let the other hear him…The locutor, the interlocutor? Sorry for the confuse answer and i would like to says that your site is the best i have found to learn very usefull things in japanese!! Apparently it would mean “let me tell you something” but i just cannot comprhend it 申し訳ありません ! Regarding your first question, I think it should be 「聞かせてもらおうか」 instead of 「聞かせてもらうか」. In this case it means “Let me hear it!” The sentence should be understood as follows: The bad guy receives a favour from his victim of letting him hear about something. The same scenario goes to: 「見せてもらおうか！」 which means “Show me!”, as in 「キサマの本当の力、見せてもらおうか！」. Regarding your second question, 言わせてもらうけど means “Let me tell you something…”. So basically you receive the permission from your 相手 that allows you to say something to her/him. The same scenario goes to: 「私の立場から言わせてもらえば…」 which means “if you allow me to show you my point of view”. Thank you for helping rysper. Generally　してもらう means have someone do something. And させてもらう means let someone do something (in the context of receiving a permission to do something). From the context you will learn who receives the favour. 友達に空港へ連れてってもらいました。 => The Speaker received the favour of taking him to the airport from his friend. マギー先生にrysperのエッセーを訂正してもらいます。=> You will receive from Maggie the favour of revising your essay. 聞かせてもらおうか sounds to me more natural in this case / context (=> a bad guy asks to his victim to tell him what he know). Hi rysper, 天人さん is already helping you but just let me add something that I didn’t mention in my lesson. You use あげる(→やる）・くれる・もらう for something favorable in general. But you sometimes you them negatively. = I will beat you up. = How could you do that to me. = I will have you pay me back what you owe me. Ex. マギーにこの文を訳してもらう。 I will have Maggie translate this sentence. Ex. マギーにこの文を訳してもらおうか。Should we ask Maggie to translate this sentence? /Let’s ask Maggie to translate this sentence, shall we? However, you sometimes use Vてもらう/ Vて+ もらおうか/(politer) Vて+ もらいましょうか when you challenge someone to do something.→It may sound polite but actually a speaker is telling a listener to do something. = I will have you tell me something. = I will challenge you to do ~ . But you also use Vてもらう・もらいます when you express your strong will regardless what one’s listener think. You use this phrase when you make your point or talk back to someone. Sorry! You mean this sentence? I would say this sentence is redundant. If i try to put in application all (but i still have a lot of work to do), 英語にしてもらってみようか means : “can you try to translate (this) in english for me?” And if the meaning is to be “offensive, negative” it becomes : “i will have you try to translate (this) in english for me”. (the 2nd example could apply to the first but i chosed it here because it sounded more “rude”^^). Thank you for the precision Maggie sensei!, i had noticed that in animes people often say “bad” things to others using kureru/ageru/moreru and i felt it was to be even more “rude” since usually you use them to add a “thankfull” nuance to your phrase. I won’t take anymore place in this page and i’m sorry to have taken that lot so far!! I am getting confused which question is to whom so I will just answer your second question. I decided to use it with appreciation. I am wondering if the following are the same. (placed inside a glass cabinet). I point to the toy and ask the shop keeper. instead of “見て”. i.e. allow me to see. Please go check my latest lesson. I explained the difference of all the forms. 値段が上がる = nedan ga agaru. Ex. 損失は１~~円に上る= Sonshitsu wa juuokuen ni noboru = The loss amounts up ~~ yen. Or when someone/something physically goes up high place. I have a question I would like to ask. I have read that, usually, てくれる expresses the idea of a spontaneous favour done to you whether or not you requested for it previously, correct? Can I use てくれる in the negative form to express that I would love that a specific person did a favour to me, but that may never happen? This is the sentence I have in mind: “He will never hug me”. I have only seen てくれない used for questions but never for negative statements so it is worth asking. = She never cooks for me. 彼に決して抱きしめられてくれない。→This sentence is not natural because it is a passive tense. So the person has sent you clovers before? 今年もたくさんのクローバーを送ってくれますか？（more casual くれる？）= Could you send me a lot of clovers this year as well? You’re welcome! It is not early. We are in 2015 in Japan now. I don’t know what you mean by “what did i get on my test?” but yes, I would avoid using もらう with my teacher. I want to tell my friend that I will give her the tickets tomorrow. But we will not be sitting together because seats number are different. I will appreciate a lot if you could and help me with this! In this case, チケットを明日あげる is better. You use あげよう in the following cases. 2) When you are telling someone who will give the ticket to her together, “Let’s give this ticket to her”, you can say あげよう. First, do you want to talk to this person in casual way? The first sentence ~あげる is pretty casual so maybe you should stick to the casual speech. Yes! I am talking to her in a casual way. OK, now I read the whole sentence, I think it will be better to use the particle は instead of を in the first sentence. Let’s compare the following sentences. So ~もらう usually implies the feeling of appreciation or happy feeling. Someone does something thinking of you. But 受け身 can be used in a negative connotation. Heya ga kitanaku natte kita kara kare ni souji wo shite moraou. Since the room is getting messier, let’s get him to clean it up. I do not understand what “kita” (before kara) means in this sentence. Could you please explain it? ～てくる has many meanings. In this sentence ～てくる shows that a certain change（変化）has been made in the past and this change is still active (to the present) . The change we are talking about is: clean room ==> messy room. 「汚い部屋を掃除してあげる」は I/we will do him a favor and clean up the messy room. Thank you for replying to my message. I can now understand that “kurete” is for thanking someone for doing something. Is there other usages for “kurete” besides the purpose of thanking someone? The other meaning of kurete? = I am happy that he came over. = K-san invited me over his/her house and cooked me delicious food. Thank you so much maggie sensei!! This lesson is so informative. Thank you so much. can you please explain to me what is “kurete”? How to use it and what does it mean? what is the difference between “kureru” and “kurete”? do I say “kite kurete arigatou or kite kureta arigatou? I’m so confused. Thank you for doing something, you always use te-form. 手伝ってくれてありがとう= tetsudatte kurete arigatou = Thank you for helping me. I came across a sentence that just said “Shinji-kun, 手あげて.” I can’t figure out what that’s supposed to mean. Nothing happens involving hands or anything like that so I can’t help but think it’s some idiom? Hello An! Happy New Year! I´m sorry sensei, because perhaps this is not the post to ask this but I don´t find any information about “ます 形+上げる/上がる”, for example, 書き上がる、作り上げる… I only know the meaning is “to just finish doing + verb” but I don´t understand, for example, which verbs with to use 上げる and which verbs with use 上がる. = I finished writing the book. I will show you other examples which use one of the forms. Transitive and intransitive verbs… Thank you Maggie sensei, I don´t know how I couldn´t notice that it was about transitive and intransitive verbs when I read this point of grammar at my book. This pattern meaning is “just finished doing…”, right? What about たて? Both pattern meanings are very similar, and don´t know very well what´s the difference between them. Thank you very much, 先生! The basic difference is Vたて modifies a noun and it has a function as an adj and Vあがる has a function as a verb. I didn´t noticed there was a lesson about 〜たて until you told me, 先生. I got an idea about 〜たて meaning because an anime called 焼きたてジャパン but with your explanation is now completly clear. As always, thank you very much for your help 先生 and I´m very sorry to answer so late to your last comment. Good to hear it is clear now. Thank you for visiting this site! I am very happy to hear this lesson is useful. Thank you very much, Maggie Sensei! Love the website. I think I will use it more frequently from now on. Hope you come back here often,too!! Feel free to leave comments or questions anytime! I came across your website after someone posted a reply to my question in italki.com. I am trying to find explaination on いただきます but while reading this article, I have another question. In this sentence, そのお菓子を息子にもらえますか？, on first look, I thought it meant ‘can I receive sweets from your son?’ Am I wrong? i was taught that から and に is interchangeable and in this case, に takes the meaning of ‘from’. just like another sentence 私はマギーにお菓子をもらった。isn’t t そのお菓子を息子にもらえますか？ the same form as it? Ah I see your confusion now. There are cases that you refer to other person’s son as 息子 in casual conversation but you don’t use ます form. Can I have the snack from your son? そのお菓子を（あなたの）息子さんからもらえますか？　is more clear in this case. thank you for your clarification. now i understand. can i say that in this case ‘に’ means ‘to’? for your last sentence, ‘そのお菓子をあなたの息子さんからもらってもらえますか？’, what is the purpose of 2 ‘もらう’? is there any difference just using ‘もらえますか’? Q 1) can i say that in this case ‘に’ means ‘to’? Q2) ‘そのお菓子をあなたの息子さんからもらって(1) もらえ(2)ますか？’, what is the purpose of 2 ‘もらう’? is there any difference just using ‘もらえますか’? if it because the に in に can act as a のために how to tell apart the に/から that indicates who gives and に acting as a のために? Then it means the speaker received that snack from A. そのお菓子を息子にもらえますか = May I have that snack for my son? 1) そのお菓子を息子にもらえますか？ May I have that snack for my son? 2) そのお菓子を息子にくれますか？ Can you give that snack to my son? Technically they means the same but 1) sounds more polite. I have some questions about the もらう part..
I’m confused about the difference between に and から used with もらう. Like you stated above, 「私はマギーにお菓子をもらった」 and 「彼からもらいました」。 Is there a difference between usiing に and から for the two sentences? Like, 「私はマギーからお菓子をもらった」？ As far as I noticed in example sentences I see that when it’s something like してもらう or おごってもらう it’s mostly (always?) に. Why is that so? Also, I have another question about に and から that is, sometimes I hear people saying 「田中さんに聞いて」, in this case can から be used? I always use から in such sentences but I was confused about the に and から usage. Hope that you can explain this to me! Thank you maggie sensei! And I am very happy to hear this lessons helped you understand the conversation with your friend.
. ｢お母さんがいつも洗濯してくれます。｣ That would mean something like “Mom always does(as an act of kindness) the laundry”? That’s it, thanks in advance, and thank you soooooooooooo much for your hard work!! You can say お兄さん、お母さん、お姉さん when you talk to your close friends but sometimes it sounds childish. As I’m a beginner it took me some time to think how to write 2.2 :S　。 I have a doubt, when you are listing situations like these (I wasn’t home and mother was ill) the tense of the last verb is the one which leads the whole sentence? or you can mix tenses? So if dad is not at home I could say something like that to the postman? I’ll definitely see the Family lesson and remember your corrections! Q 1: when you are listing situations like these (I wasn’t home and mother was ill) the tense of the last verb is the one which leads the whole sentence? or you can mix tenses? Ah, good question! Yes. When you simply list two past actions in one sentence, change the last verb into the past. I wrote a letter and mailed it. Q 2: So if dad is not at home I could say something like that to the postman? if there are, can you explain me? 何もしてくれない= You don’t do anything for me. 何もしてくれたこと(が)ない= You haven’t done anything for me. i’m a 14 years old student and i learn japanese in myschool..
Arigatou for your comment! Wow! You are 14 years old and learning Japanese? Ganbattene!!! Good luck! Feel free to leave comments or ask questions here anytime! oh wow sooo useful!!! thank u!!! You’re welcome! It is not easy to master these. Keep practicing here or on Twitter! OK, I just tweeted the questions now. Check it out! Despite being a pretty fluent Japanese speaker, this topic still causes me confusion. Thanks for the help in understanding it better. Thank you for checking the lesson,too! I’m glad to hear it helps you. thanks very much sensei,, its really helpful definitely it was the best explanation of shite ageru/morau/kureru, now i have no doubt to say that i have no more doubts regarding these phrases. I mean, ガチで、I don’t know how I can have lived without your site! I understand it is a deep topic and it might need an entire lesson about it, but you already helped me a lot right here! Thank you very much! This was as always a clear and Nice explanation! May I ask one more thing on this subject? Talking about your site, it is really neat, and the concept of image lesson is a funny idea! Keep it up! Good question but this theme is very deep. I will just explain a part of it here today OK? but I would say in many cases, people use it without distinguish them. The things you should do. The translation is the same but やる shows stronger will. They both mean “What are we going to do?” But (b) implies to do something more special involving your action. And the we tend to use やる for something special and する for normal stuff. Also there are cases that you can’t use one of them. I made it! / I did it! But there are more…I should make a lesson someday, huh? I’m happy to hear you have been using this site! I am now aware that it won’t sound weird of I use the あげる form! That’s a good thing! Concerning the last paragraph, is it because it is やる used on its own, as a verb, not as a “form coming after a 〜て verb”? By the way, I’ll take some time to read your entire site, from begginer lessons (we can never learn too much, even the basics), up to the higher levels (I really appreciated some if the colloquial and very polite posts). As a matter of fact I have created an IRC channel to exchange interesting links, talk about Japanese, and help each other when needed, but it is still a bit young, and I come accross my limits quite often. So be sure the address of your site will be given each time! Thank you for your time, this kind of site is what makes Internet a great place to discover! Actually やる has different meanings. These やる means “to give” and 「さあ、やってみよう！」’s やる means “to do”. Ex. 1)　何をしているの？=何をやっているの？ What are you doing? Ex. 2)　宿題をしないといけない＝宿題をやらないといけない。 I have to do my homework. Ex. 3) これしてくれる？=これやってくれる？=Can you do it for me? They are all used commonly both by boys and girls. Those are only for inferiors, people who are younger than you, or someone who is very close to you, like your kids or younger brothers or sisters. This site is relatively new. I am still doing lots of experiments. But I always try to include information for any levels both colloquial and formal. I have a question about “〜て やる”. First, is it really less formal than “〜て あげる” ? I mean, it has always seemed to me that やる was more of a male speech usage and あげる a female one. If it is true, is a boy saying 〜てあげる really sounding “female” or is it just like sentences ending with 〜くださいね。(where it tends to be more used by female, but can be used by male as well) ? If you could give me a clue, it would be really appreciated! When I made this lesson, I thought I would make a different lesson about やる(=yaru) because this lesson got too long as usual and it completely slipped my mind. Sorry! !gomenchai! First of all, あげる is a polite form of やる. As you said women should avoid using やる because it sounds very blunt. On the other hand あげる is just a politer form of やる and it doesn’t sound effeminate at all. So you (boys) can use it anytime. Let’s compare these together OK? They both means the same thing but 1) sounds much nicer. But there is other やる which is not rough. If you deal with animals or plants, you can use やる anytime and both men and women can use. I have just found your blog and I must say your work is impressive ! I have been self learning Japanese for a while now but has been having difficulty linking the formal Japanese that I am learning as compared to spoken Japanese in the drama/movie. Japanese you have learned with a text book is very formal. But we don’t always talk like that. I will try to make lessons mixing both formal and colloquial Japanese. And please feel free to practice writing in Japanese and I will correct you!